This year I got an interesting birthday gift – Tenga Egg. When I first saw it I thought “What the hell is this??”. Then, when they explained me that it’s a super-duper masturbator I was kind of skeptical that this will make some magic because it looks so small and innocent. I mean, it’s just an egg. Well, boy was I wrong. What I wasn’t aware is that this egg is made from high quality, ultra soft silicone, which can be stretched more than you’ll need (30 centimeters). I was very curious to try it the next day. I opened it up carefully, added some lube that comes with it and few seconds later magic started. I was pleasantly surprised. It feels really great…like ‘wooow’. I must add that this is the first masturbator that I’ve ever tried so I can’t compare it with anything else (besides the real thing or my hand). The one I got and tried is Tenga Egg – Spider. Later I found out that there are seven of those little eggs, each with different texture. 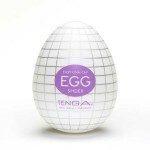 So you will get different kind of strokes with each of these Tenga eggs (and I guess a little bit different feeling)! The downside: It wont last forever. The silicone will stretch after some time and the feeling wont be so good anymore. So, you can use them for 10 times tops if you handle and clean them regularly. All in all, considering its low price (you can get the whole pack with all six eggs for just $35.95), and a great feeling I think it’s really worth of trying. It can also be a cool gift.